On St. Patrick's Day in first grade, my teacher Mrs. Hiatt told our class about going to Ireland and kissing the Blarney stone. I was enthralled. It seemed miraculous to me that the kissing of a cold old stone could procure the gift of gab. At age six, I made up my mind that I would someday go to Ireland, smooch that Blarney stone and secure the golden tongue for myself. (Although, I'm sure if you would have asked Mrs. Hiatt, she would have said I already had the gift of gab in spades. I was forever in trouble for my motor mouth, as she called it. The gift of gab sounds so much dearer than the gift of the motor mouth.) At age 23, I planned a trip through the UK with a friend. We tromped through England, Wales, Scotland...and then political trouble kept us out of Ireland. I've always felt cheated out of my first grade dream, plus I sort of forgot about it for about a decade, in pursuit of other dreams for other grades. (I think it's been revived by all the cheap travel offers that keep finding their way into my inbox.) So, I've started saving. I have exactly $432.78, about 1/20th of what I need to get my family of four to the Emerald Isle. It's further motivation to keep the grocery bill down, since the savings go straight towards my dream fund. In the meantime, here's a taste of Ireland that anyone can afford. This luxurious soup is a little on the creamy and indulgent side, but it makes a delicious St. Paddy's day lunch or dinner. Especially with a corned beef grilled cheese on the side-see you Sunday with the recipe. Money Saving Tips: Use homemade chicken stock, canned broth or bouillon cubes in this soup. Buy the 5 lb. bag of potatoes, since you'll use half of it here. You can swap out the half and half for canned evaporated milk. In a large stock pot, melt 1 tablespoon butter. Add onion and cook until softened about five minutes. Add potatoes, carrots and broth. Bring to a boil, reduce heat and simmer for about 20 minutes, or until vegetables are softened. Using potato masher, roughly mash vegetables in pot, not into a puree, but into small pieces. In a small bowl, combine remaining 3 tablespoons butter and flour into a smooth paste. Stir into soup. Bring to a boil, stirring constantly and cook for about three minutes, or until soup thickens. Stir in half and half; reduce heat and do not return soup to a boil. Season to taste with salt and pepper, lemon juice and a bit of tabasco. Garnish soup with chives. Love your potato soup St Patty's post. For a fun pizza twist check out my Irish Corned-Beef and Cabbage Pizza, it was really spectacular!! The soup looks delicious and I can't wait for Saint Patrick's day. I'll be watching for that corned beef sandwich! I'm sorry you weren't able to kiss the Blarney stone, but it souds like you're on your way! You could also drop a few drops of green food coloring it it for fun! Just not sure who would then eat it. Might be a little gross. I'd love to go to Ireland. That is the only place my parents have ever been outside of the USA and they loved it! I love hearing your stories, I totally forgot about Mrs Hiatt. I will make that soup as soon as we are done with the slow cooked ckicken. I always enjoy hearing your stories! Your soup looks fantastic!! Interesting looking! My dearly beloved has no desire to leave the country, so we won't be kissing the blarney stone any time soon. He has the gift of gab in spades anyway - enough for both of us. Good luck saving the other 19/20ths of your trip price! Great looking soup! Probably not Irish, but this soup screams for some crumbled crisp bacon I think? Happy St. Paddy's Day to you. My great grandmother was born in Tipperary and of course, my name is Irish, so I love the holiday. Here's hoping you get to kiss that stone soon. And just an FYI, the view from the top of Blarney Castle is amazing. Mmmm, mmm! We love indulgent soups! I am a St. Patricks day fanatic! It has always been big in my family even though we are not Irish! Can't wait to down some corned beef and cabbage! I hope you get to kiss the stone! Irelond sounds awesome! My mom went last year and loved it! That soup looks great. Good luck with your savings. Prudy, my first grade teacher nicknamed me Chatty Cathy. I think if we sat next to each other in class, we would have gotten split up in three minutes. This soup looks wonderful! We have a cold and rainy weekend ahead of us, and this will hit the spot! I hope your trip happens soon! I love that you still remember your first grade teacher's name. I remember every teacher I've ever had and was shocked when my eighteen-year old son told me he didn't remember who several of his teachers were! I love the idea of hanging upside down high up in that ancient castle. I talk too much as it is, so I would be dangerous if I kissed it! I love potato based soups. They are inexpensive and always delicious! Most excellent goal and recipe! I have always wanted to visit Ireland, too. Hope you get there soon. Your posts are so fun to read! I am excited to try this soup and even more excited to have a good corned beef recipe for my St. Patty's dinner. I always try to do it all green-- just for fun! I've been to Ireland and it truly is enchanting. One of my favorite trips I've been on! Kissing the blarney stone-- okay, you walk up what feels like thousands of steps and not only do you lay down you your back, but you have to slide out and hang over the edge upside down by holding onto a couple of bars. There were many who wouldn't do it because of the height and such. It's a little exciting. At least I can say I did it, but you really have to wonder about all those germs, huh?? Oh, well. 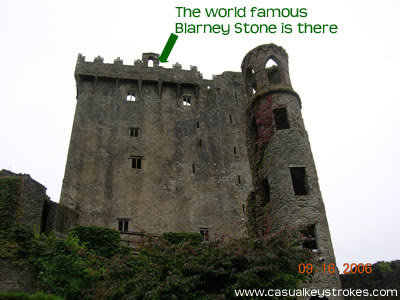 Don't think any one has died yet from kissing the blarney stone. And I definitely didn't need the gift of gab. I'd have been in trouble sitting next to you, too. I've always wanted to go to Ireland too. My sister wants us all to do a big Europe crawl, a la the Grizwalds. I don't think Europe is ready for the Blond Duck and Queen Bitty. Can't wait for that sandwich! Oh my goodness I would love to visit Ireland but you know.. I have no idea when St. Patricks day is..how sad is that. Oh that looks yummy! I thought I was Irish'd out and planned on ordering out Mexican tonight (yes really)... perhaps I'll make some potato soup instead.